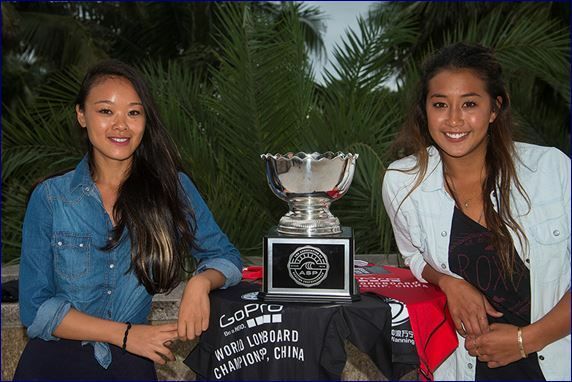 LEFT to RIGHT – Darci Liu (CHN), Harley Ingleby (AUS), Chloe Calmon (BRA), Taylor Jensen (USA) and Kelia Moniz with the ASP World Longboard Championship cup. PIC ASP. 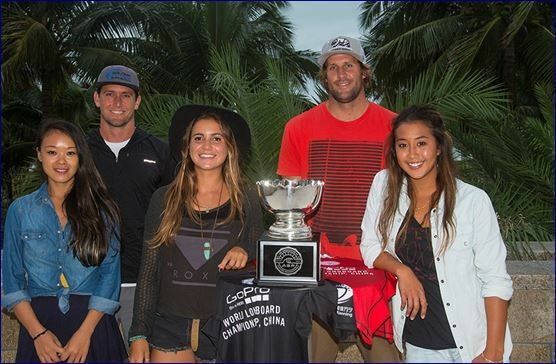 GoPro World Longboard Championships Open With Style in China WANNING, Hainan/CHINA (Thursday, December 4, 2014) – The world’s best surfers on traditional nine foot plus boards have arrived in Hainan Island for the annual GoPro World Longboard Championships, China hosted by Wanning (WLC). The field includes 34 surfers in both the men’s and women’s divisions with surfers from over 12 countries in attendance. Tonight the athletes and officials were treated to an explosive opening ceremony and competition is expected to start tomorrow morning.